In the previous post we explained what a coach, whose team plays in a 1:4:3:3 formation, can do during the game if the opposing team switches from 1:4:3:3 to a 1:3:4:3 formation. The options to influence his players vary from making some substitutions to adjusting the style of play. A thorough preparation of your players for such a game situation is obviously essential. How do you prepare your team for this? themselves and discover which solutions in the various situations offer the best results. In this article we will focus on the offense, in which the objective is to improve the build-up out of which scoring chances need to be created. The players need to be made clear during practice what the threats and opportunities exactly are if the opponent switches from 1:4:3:3 to 1:3:4:3.
be reached (one against one). • The pressure starts immediately when a defender receives the ball. There is a risk that the ball will be lost close to the penalty area. We consider three attackers playing one on one with three defenders a chance. 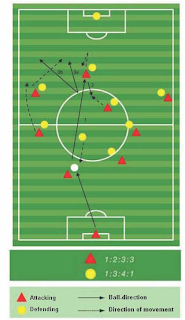 ball from the goalkeeper or a defender (see drawing). With this exercise the players are practicing how to neutralize the first threat that was described above and in which at the same time the action is aiming to create chances (which is the purpose of a build-up). • The players with the ball (pass the ball in front of your teammate so he has the possibility to immediately pass the ball on, pass the ball once the contact with the attacker has been established, and take your opponent on when you are facing him in a one v one situation etc.). 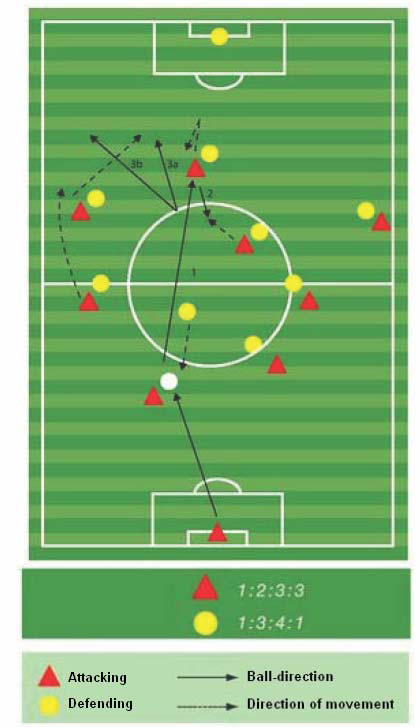 • The players without the ball (free yourself from your direct opponent, take advantage of the space created by teammates, move into space “in the back of” (behind) an opponent, so he looses eye contact with you). • The opposing team (first back off (low pressure), then pressure on the player with the ball, immediate pressure on the players with the ball, take away all the passing options for the player with the ball, etc.). midfielders can move forward towards the “second” defender, which would result in the goalkeeper having to pass the long ball.